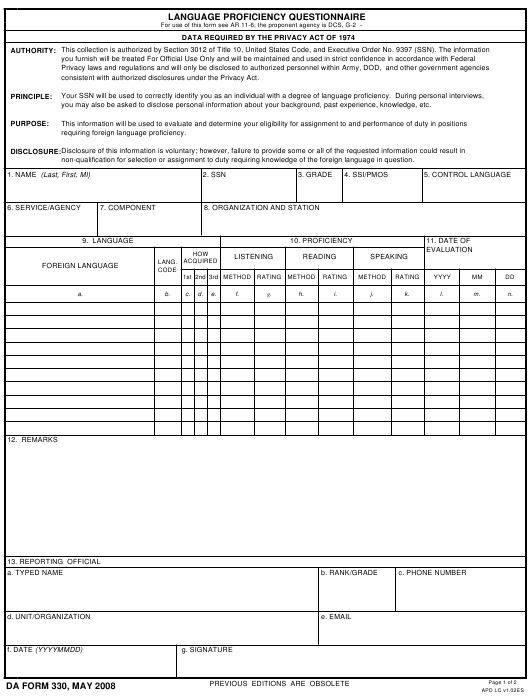 DA Form 330, Language Proficiency Questionnaire is a form that records the results of foreign language proficiency tests undergone by U.S. Army personnel. The information within the form is used to evaluate foreign language skills and to determine eligibility for positions that require foreign language proficiency. The latest version of the form - sometimes incorrectly referred to as the DD Form 330 - was released by the Department of the Army (DA) in May 2008 with the previous editions being obsolete. An up-to-date DA Form 330 fillable version is available for digital filing and download below or can be found through the Army Publishing Directorate website. What Is DA Form 330? The U.S. Army provides a number of jobs that require the soldier to have a fluent knowledge of a foreign language. The Department of Defense (DoD) uses the Defense Language Proficiency Test (DLPT) to measure the ability to read and listen in a foreign language. Exams are taken annually - normally after an language maintenance course - but can also be taken every six months at will. A service member proficient in one or more foreign languages can be granted special pay via the Foreign Language Proficiency Bonus (FLPB) - formerly known as the Foreign Language Proficiency Pay. Bonus payments range from $100 to $500 a month, depending on the language or dialect spoken and the documented level of proficiency. Top-loading of the control language (CLANG) or language identification code (LIC) into the enlisted master file (EMF) by the Commander. How To Fill Out Da Form 330? For use of this form see AR 11-6; the proponent agency is DCS, G-2 . consistent with authorized disclosures under the Privacy Act. you may also be asked to disclose personal information about your background, past experience, knowledge, etc. non-qualification for selection or assignment to duty requiring knowledge of the foreign language in question. CONTROL LANGUAGE. Leave blank, U.S. Army Human Resource Command use only. SERVICE/AGENCY. Enter the individual's Service or Agency. COMPONENT. Enter the individual's Service component, e.g., Active, ARNG, Reserves. ORGANIZATION AND STATION. Enter individual's organization and station. entered on one line. If the skills for the same language are evaluated on different days, enter them on separate lines. FOREIGN LANGUAGE. Enter the foreign language evaluated. LANGUAGE CODE. Enter the language identification code for the foreign language evaluated. proficiency was acquired by more than one method. METHOD. Enter the language evaluation method using the codes listed below. RATING. Enter the data code based on the proficiency rating using the codes below. Enter the year in the format YYYY for each foreign language tested. Enter the month in the format MM for each foreign language tested. Enter the day in the format DD for each foreign language tested. or equivalent, enter the class number and date completed. Boxes 1 through 4 contain personal identifying information about the service member undergoing evaluation. Box 5 - Control Language - should be left blank. Boxes 6 and 7 require the soldier's Service Branch or Agency and their Service Component (Active, Army National Guard (ARNG) or Reserves). Box 8 is for specifying the organization and station of the service member. The columns in Box 9 are completed with the test results for each language evaluated. Multiple skills of the same language measured in the same day can be entered on one line. Skills evaluated on different days are entered on separate lines. Box 10 rates the service member's listening, reading and speaking proficiency and specifies the method of evaluation. Box 11 provides the dates of each test taken. The type of DoD Standard Test - DLPT-I, DLPT-II, DLRPT, DLPT-III, DLPT-IV, DLPT-5, or Oral Proficiency Interview (OPI) - is identified in Box 12, Remarks. The lines in Box 13 provide the personal identifying information of the reporting official.